As soon as I saw this recipe, I started salivating at the mere thought of this dressing. I remember it well, as going to the Old Spaghetti Factory as a kid was always something we anticipated. It seems like we would wait forever to be seated. Did they not take reservations? Or did my parents not make them? Hmmm. Anyway, we were always starving by the time we sat down and we would devour the bread and salads put in front of us. As an adult I appreciate that most of their locations are housed in old historic buildings but as a kid all I cared about was how there was always a streetcar in the middle of the restaurant. You could sit in it and have dinner, but we never got those seats. We always had a booth that was usually made from some brass headboard of a bed. I wanted that streetcar. Anyway, I only made a couple teeny-tiny adjustments to this recipe, otherwise I loved it! So good over a crunchy salad. You must have croutons, preferably homemade, with this…to die for!! Combine all ingredients in a large mason jar and shake vigorously until mixed. Can be served right away but tastes so much better if given time to let flavors meld in the refrigerator. I really think this is very good for a pasta meal, a good variation from the regular tomato based sauce. I really thing the sauce makes the meal, no matter what it is. You are right, if they did take reservations we never had them and had to wait forever we never sat in much coveted streetcar. Thanks for the recipe and trip down memory lane. Must make this over the weekend. Sounds incredible, Cathy! I remember the spaghetti in Toronto very well!!! We never got into that streetcar because there were always 5 of us! I always loved their salad, and spaghetti with mizithra cheese/browned butter…now I’m halfway to recreating that meal! One time we actually got to eat in the streetcar. My daughter was 2 years old and little did I know that she was dropping bread crumbs out the window and onto the woman sitting at the table below us! 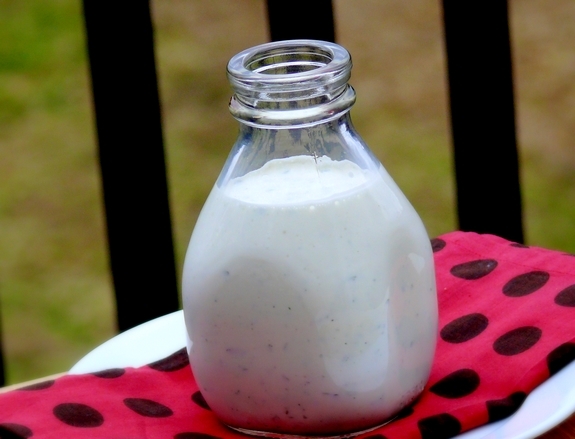 oh my goodness, i used to go to the spaghetti factory just for this salad dressing – love it so much!! i’d ask for extra on the side and dip my bread in it. can’t wait to try it at home. Just mixed up a batch and can’t wait for dinner! I had forgotten how good this dressing was. Other copycat recipes use oil, which is totally unecessary. This recipe takes the cake. Yum! This looks yummy. We have a mayo-hater in our house – any suggestions for an acceptable mayo substitute in this recipe? Replace mayo…eeks I’m not sure how to replace that mouthfeel. That’s a tough one. Sour cream, but it will have less flavor and again…mouthfeel. hey i made this and the flavor is spot on however it is very much liquidy! any suggestions to thicken?